African Elephants: Taken for “Blood Ivory” – BOBBY JAMES. In the October 2012 issue of National Geographic, there is a special investigative report by Bryan Christy. The report identifies many Asian countries (primarily China) as the largest consumers of [black market] ivory and explores the “loopholes” surrounding the illegal ivory trade (hint: most of the “loopholes” are religious). In 1989 the Convention on International Trade in Endangered Species of Wild Fauna and Flora (CITES) banned ivory trade (these governing sanctions went into effect in 1990). The ban was sought after an estimated 600,000 elephants (or roughly, half the wild elephant population) were slaughtered for their ivory throughout the 1980s. Since the ban, the ivory black market is booming with profitability. In fact, National Geographic reports that the cost per pound for Grade A ivory at Beijing’s Ivory Carving Factory, which legally sells ivory, is roughly $530 per pound. So imagine the cost on the black market. This past Spring, when I completed a mock grant proposal (The Bobby-james Wildlife Effort) to combat illegal ivory trade, my black market figures were staggering. I used prices from boonetrading.com to calculate my figures. Their site lists raw ivory at $2.00 per gram. 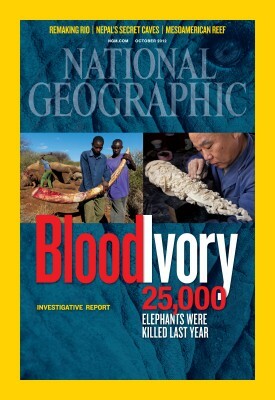 Given there are 453.6 grams in a pound, I found that raw ivory could earn as much as $907.20 per pound. Combined, there is an estimated price range between $530-$907 per pound of ivory – this is a lucrative business generating billions of dollars annually. The assumption is that each elephant contains approximately 22 pounds of ivory. Given the price per pound, a herd of 50 elephants would generate between $583,000-$997,700. Then think, tens of thousands of elephants are losing their lives annually. Unfortunately, this epidemic is not a new phenomenon. Ivory trade is believed to date back to the origins of society and as Bryan Christy highlights, ivory was a gift/good rumored to be used during the explorations of Ferdinand Magellan during the 16th Century. In 2010, I produced a documentary short titled The Ivory Role calling attention to poaching and the illegal ivory trade. 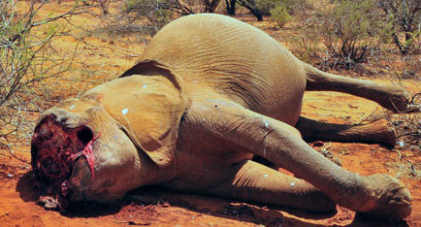 Since then, poaching reached its highest levels in a decade when at least 25,000 African elephants were poached in 2011. Estimates show that 34.7 tons of ivory was seized globally last year and data from 2012 remains inconclusive. Alarmed? You should be. In addition to poaching, African Elephants are considered a member of The Big Five (Elephants, Lions, Leopards, Cape Buffalo, and Rhinoceros), a phrase used to describe the danger and degree of difficulty trophy hunters will have hunting these mammals on foot. Unfortunately, Safari Club International offers a trophy for hunting all five species called the “African Big Five Grand Slam.” Combined with poaching, those who aren’t hunting for food place the African Elephants future at risk. What’s worse is that isn’t all the surprise to be found – learn more in Bryan Christy’s article “Ivory Worship” in National Geographic. Learn what country is violating a deal with CITES and how Christy was told to smuggle ivory. To do my part, in the near future, I will produce a follow-up documentary short to The Ivory Role to help provide elephants with their own viral voice. How will you help? If you don’t care, why not? Let’s hear it.